Definition at line 16 of file PreprocessorOutputOptions.h. Definition at line 29 of file PreprocessorOutputOptions.h. References RewriteImports, RewriteIncludes, ShowComments, ShowCPP, ShowIncludeDirectives, ShowLineMarkers, ShowMacroComments, ShowMacros, and UseLineDirectives. Include contents of transitively-imported modules. Definition at line 26 of file PreprocessorOutputOptions.h. Referenced by clang::RewriteIncludesAction::BeginSourceFileAction(), clang::CreateFrontendBaseAction(), clang::RewriteIncludesAction::ExecuteAction(), ParsePreprocessorOutputArgs(), and PreprocessorOutputOptions(). Definition at line 25 of file PreprocessorOutputOptions.h. Referenced by clang::CreateFrontendBaseAction(), ParsePreprocessorOutputArgs(), and PreprocessorOutputOptions(). Definition at line 19 of file PreprocessorOutputOptions.h. Referenced by clang::DoPrintPreprocessedInput(), ParsePreprocessorOutputArgs(), and PreprocessorOutputOptions(). Definition at line 18 of file PreprocessorOutputOptions.h. Print includes, imports etc. within preprocessed output. Definition at line 24 of file PreprocessorOutputOptions.h. Definition at line 20 of file PreprocessorOutputOptions.h. 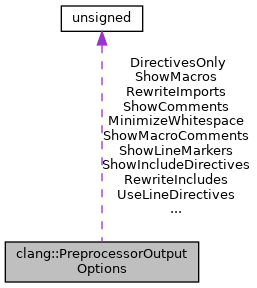 Referenced by clang::DoPrintPreprocessedInput(), ParsePreprocessorOutputArgs(), PreprocessorOutputOptions(), and clang::RewriteIncludesInInput(). Show comments, even in macros. Definition at line 22 of file PreprocessorOutputOptions.h. Definition at line 23 of file PreprocessorOutputOptions.h. Use #line instead of GCC-style # N.
Definition at line 21 of file PreprocessorOutputOptions.h.